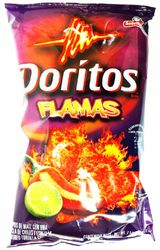 Flamas tortilla chips are the hot chile and lemon flavored tortilla chips, with a powerful crunch. Can you handle the heat? Experience that ballistic Doritos crunch as it ignites a fire explosion of chile in your mouth with a hint of lemon, unlocking the unique and bold flavors you crave. Say Hello to Doritos Flamas!. Ingredients: Whole Corn, Vegetable Oil (Contains One or More of the Following: Corn, Soybean, and/or Sunflower Oil), Corn Maltodextrin, Salt, Citric Acid, Sugar, Monosodium Glutamate, Artificial Color (Red 40 Lake, Yellow 6 Lake), Hydrolized Corn Protein, Yeast Extract, Sodium Diacetate, Cheddar Cheese (Milk, Cheese Cultures, Salt, Enzymes), Modified Corn Starch, Natural Flavor (Including Natural Extractives of Red Pepper and Natural Extractives of Lime), Onion Powder, Whey, Corn Syrup Solids, Garlic Powder, Romano Cheese (Part-Skim Cow's Milk, Cheese Cultures, Salt, Enzymes), Buttermilk, Whey Protein Concentrate, Disodium Inosinate, and Disodium Guanylate. CONTAINS MILK INGREDIENTS. Doritos FlamasTotopos de maiz marca Doritos Flamas con una mezcla de chiles y especias.Doritos Flamas con sabor a chile con una pizca de limon con un sabor crujiente y poderoso. Puedes aguantar el calor? Experimenta el sabor crujiente y Bal�stico de los doritos, mientras se enciende una explocion de fuego de chile en tu boca con una pizca de limon, liberando los sabores unicos y fuertes que se te antojan. Dile Hola a Doritos Flamas! These Flamas flavor Doritos have a nice spicy kick to them. Not too spicy where it burns. They taste similar to the El Sabroso Baja Limon Flavored Tortilla Chips. The Flamin' Hot Dorito flavor is still my favorite. But that flavor is no longer in production. And this Flamas flavor is sparsely supplied. Exactly what I wanted. The area I live in near downtown Dallas, neither the Kroger nor the Fiesta carry Flamas. Kroger never did but the Fiesta stopped a month or so ago. I live in Maine so it's very rare for me to find spicy chips. My husband and I very much enjoyed these chips delicious and spicy we were not let down. ProsQuick delivery and excellent customer service. ConsThe only issue I has was a popped bag but I just put the chips in a large zip lock bag and it worked great. I had to buy them in three and they were packed with bubble wrap. Can find these in New England happy to see them online. This flavor is a bit hit in my household. My kids love them as well as my wife and I.
I love these chips ! ! ! I have to order them from mexgrocer and have them shipped to me because they NEVER HAVE THEM HERE ! ! ! Thank goodness for mexgrocer ! ! ! 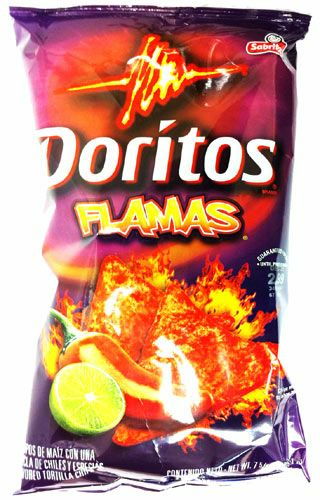 You must try these chips ( if available in your area ) you will love the heat and the lime kicks in for a fire citrus flavor I'm addicted to ! ! ! Get Some Today, and get them from mexgrocer. ! ! ! ProsThe awesome flavor ! ! ! I loved these chips! This was the first time I had tried them and it won't be the last! Can't get these here in TN. Bought them for my Son in Law for Christmas. What a great surprise for him :-) He LOVES them. This is a great site with lots to offer. I will be shopping with you again for sure. Great communication and fast shipping. Thanks so much. These r the BEST thing Dorito has came up with!!!!!!!!!!!!!!!!!!!!! I absolutely love these Doritos.. I cant get them where Im at so I have to order them.. I love the hint of lime!! These are probably the best doritos ever. Plus, after a few bites they had my nose running from the heat! Delicious enough to order since I can't buy them in the midwest!